In the college football world, the BYU Cougars went from being #20 all the way into the Top 10 after upsetting #3 Oklahoma on Saturday. Yep, they’re ranked #9 in the new poll. This is great news for BYU! While they are always a threat to pull an upset every season, this year they definitely look for real. Oklahoma is anything but an easy win, and beating them was a true statement for BYU. They could be this year’s Utah, who last year went undefeated, nabbed a sweet spot in the Sugar Bowl, and ousted Alabama, who was #1 the entire year. Congrats to BYU. Out of the NFL, it looks like Michael Vick is fulfilling his promise of being a local Philadelphia community leader. Yesterday, Vick spoke to a group of 200 freshman entering Nueva Esperanza Academy. He told them to not listen to “peer pressure”. Vick noted that so many people were pulling him in the wrong direction, and he opted to listen to them instead of just going his own way. This resulted in heinous crimes against animals, 18 months in prison, and the loss of a ton of money. The students listened to every word, and you can bet the Eagles and Vick will organize a host of these type of events during the course of the season. Finally, an update on the Tila Tequila drama. 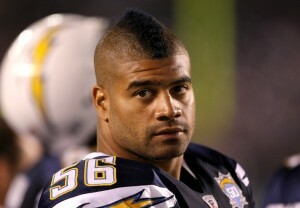 On Sunday, San Diego Chargers defensive back, Shawne Merriman was arrested for allegedly choking and throwing Tila Tequila. Well, in Merriman’s side of the story, he told police that Tila was drunk and he tried to restrain her from getting in the car and driving. Now, Tila’s lawyers are saying that this was nothing but ‘spin’ — that Merriman is just trying to get himself out of trouble. Tila’s lawyers expect Merriman’s story to be discredited. And if you want to play detective, it was reported that Tila Tequila had ‘gone quiet’ on her Twitter feed after the event. Clearly something serious must have happened for her to cease the only thing that makes her popular… online communication. For those that don’t remember, Tila’s fame came from having the most friends on MySpace during its heyday. It led to an MTV reality show, and now she is pursuing other mass media projects. So for her to “go quiet”… something’s up.